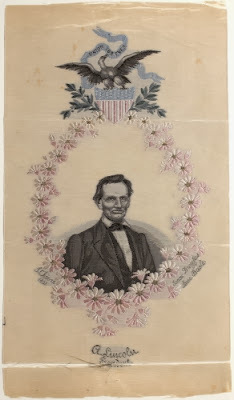 This is a ribbon meant to commemorate Lincoln’s inauguration in 1861. It’s not a flattering likeness, though, goodness knows, what Lincoln was facing would age any person. It is most likely a print copied from one of the many photographic portraits taken of Lincoln by Mathew Brady (1822–1896). In the day with no electronic media, such ribbons also served as campaign propaganda, along with copper tokens bearing a candidate’s likeness, trade cards, and even small effigies of candidates such as puppets and wooden figures. This inauguration image sadly reminds us of the horror the US was about to face in the Civil War. The kingdom of ancient Meroë (southern Nubia, contemporary Sudan) co-existed with ancient Egypt on the southern end of the Nile, and adopted many of their artistic conventions. One such convention, unfortunately, was lauding a ruler as a great military leader in sclupture. 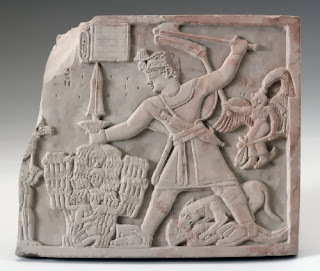 Although this prince died young, he is depicted as a zealous defender of his kingdom. This monument was dedicated to the Roman emperor Trajan (ruled 98–117 ce) and his military campaigns against the “barbarians” along the Danube River (Austria) ca. 102–107 ce. Apparently crushing the native people of Germany, Switzerland, and France was not enough for the Romans. They conquered any culture they thought would be a threat. 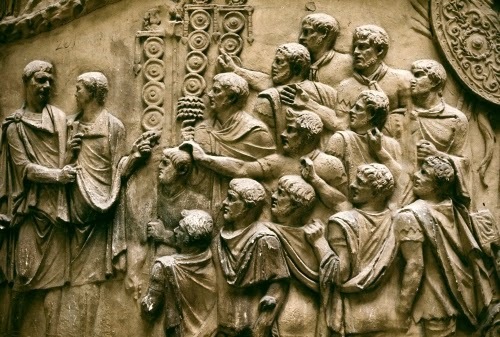 This column celebrates Trajan’s victory over the Dacians (Austrians) thus (supposedly) lending stability to the Empire. 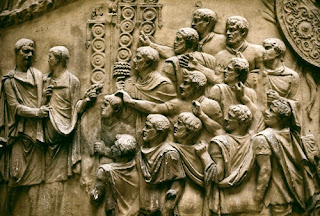 Roman art sought to not only honor ancestors, but also their deeds. Depictions of the deeds of emperors were spread throughout the Empire in the form of public sculpture. 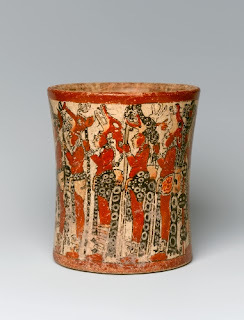 The Maya dominated Central America from Mexico through Guatemala and Honduras. Their culture flourished between 800 bce and roughly 1100 ce. It was unfortunately a society steeped in martial ritual, as many ancient cultures were. The Jaguar Guild was an elite warrior society that is represented here, on a ceremonial cup, as well as in temples and tombs. They wear animal headdresses and the jaguar symbol is belted around their waists. What war isn’t stupid? 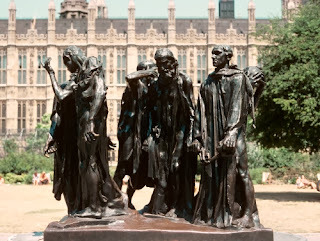 This sculpture commemorates an event during the Hundred Years War (begun by the British in 1337) when the English besieged Calais and asked for the six most prominent citizens as sign of surrender. Rodin’s expressionistic depiction of this grim event in French history was influential on modernism in art of the early 1900s. Rivera was a leader in the revival of frescoes and wall paintings. He did so in commemoration of the Mexican Revolution (1910). 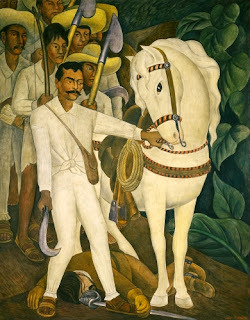 Through his murals, Rivera sought to elevate the Mexican people’s self image as divorced from Spanish conquest. This fresco depicts a famous Mexican revolutionary who was fighting for the rights of poor farmers during the Revolution. 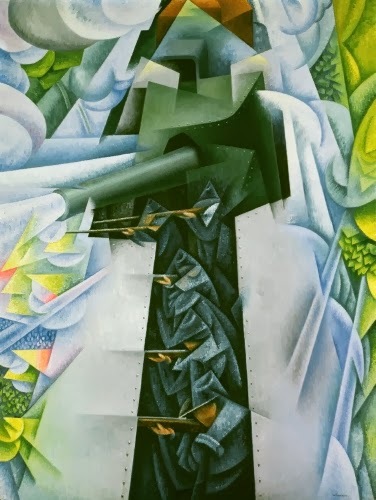 Futurism was an offshoot of Cubism. It emphasized movement and the mechanized age. This work paints a pretty picture of an otherwise grisly phenomenon on World War I (1914–1918). It aptly blends the Cubist emphasis of time elapsed action with the brilliant color associated with Post-Impressionism. Lê was a migrant to the US after the fall of Saigon in 1975. She has since used photography to explore the ironies of war and the cost on human lives. 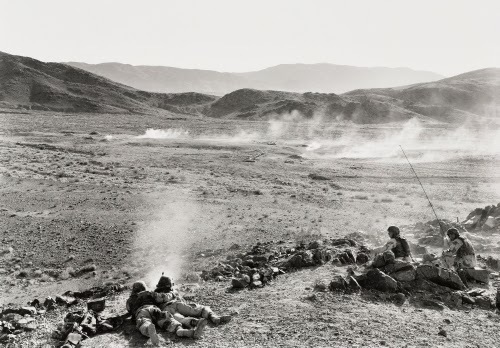 This series of photographs documents the training of US soldiers for the war in Iraq. The desolate landscape enhances the idea that war is a waste.